This quick bunny craft is great for Easter or anytime. What You Need: paper plate; red or pink pom pom; 2 cotton balls; black marker; red or pink construction paper; glue; scissors. How to Make It: Cut out ear shapes and glue to back of plate. Glue on pom pom nose and cotton ball muzzle. Use marker to add mouth, whiskers and eyes. 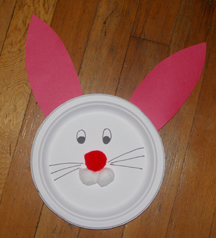 This entry was posted on Saturday, March 22nd, 2008 at 4:15 am	and is filed under animal crafts, Easter crafts, paper plate crafts. You can follow any responses to this entry through the RSS 2.0 feed. Responses are currently closed, but you can trackback from your own site.